How Your Precious Gems Came To Be……. Rich Dover had a background in graphic design and a previously active life that included activities like kayaking and climbing mountains before multiple sclerosis and spinal disk perforations severely curtailed his mobility. Unable to spend the remainder of his life “doing nothing”, he sought a hobby that stimulate his mind while allowing for the physical limitations of his disability. He found that his keen eye for detail, developed in the printing industry at a time before the invention of Photoshop when cutting in film was a meticulous skill learned through apprenticeship, transferred easily to cutting facets in precious gems and shaping cabochon stones, particularly opals. He began to develop a network of ethical sources for rough stone and sold a few finished pieces to finance the materials to continue his hobby. He opened a group on Facebook to compare notes with other gem cutters and form an online community. This was called My Precious Gems and continues to be a thriving, active group. The group attracted a range of hobbyists and professionals in the jewellery trade and high end jewellers began to notice the quality of stones that Rich sold, reflecting prices directly related to cost rather than bumped up as many commercial sources tend to do. Requests came in for specific types of stones and Rich resourced ethical traders internationally through his network of rough stone suppliers. Quality remained paramount and Rich refused to deal in second quality facets or ‘junk’ stones. By the time the group grew to over 1000 members, the hobby had become too profitable to remain a hobby and blossomed into a sole tradership. In March, 2017, Rich Dover recognised that the rapidly escalating turnover had reached a level where officially starting a business was required. He hired an accountant, registered with Companies House, obtained a business bank account and started the website you are currently reading to accommodate the needs of the business. Rich continues his hands-on presence in the My Precious Gems Facebook group despite the success of Your Precious Gems. It was, after all, only intended to be a hobby for a disabled man. 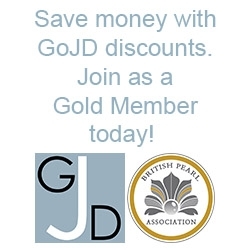 Your Precious Gems are pleased to offer a 15% discount to subscribing Guild of Jewellery Designers Gold members using the code found in their guild account dashboard.